It’s time. Strawberries are coming in full force. And just because she’s not wearing a ring doesn’t mean you should go getting ideas. It wears her out to carry that enormous rock around all day…lol. 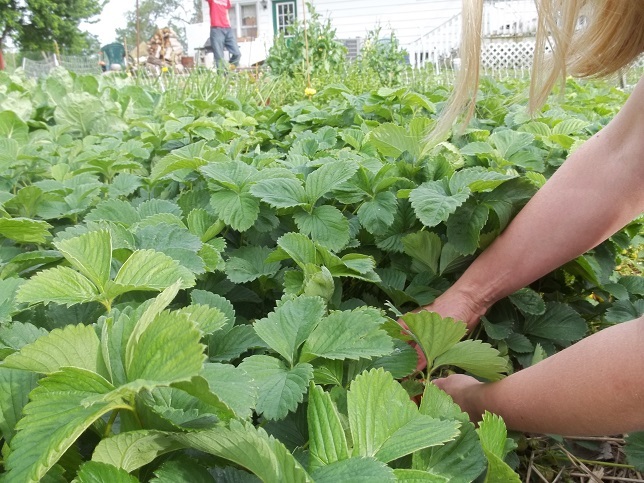 Last year I planted strawberry plants with the Jeavon’s grid in a 20′ row, 4′ wide. In the fall I had so many runners I planted the other 20′ of the row. Both ends of the row are very, very productive this year. 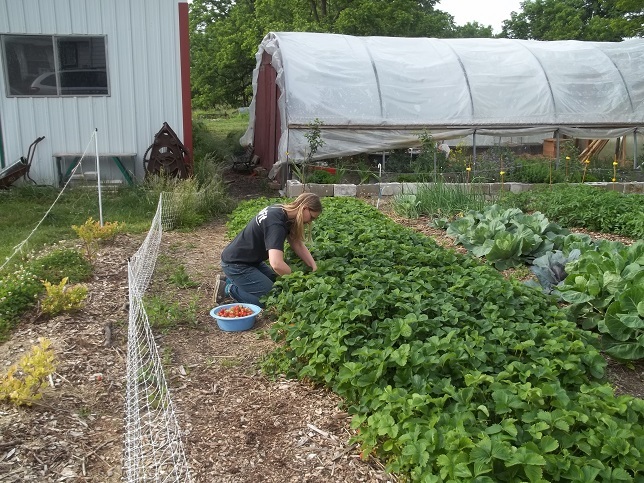 Because the row is 4′ wide we can easily reach in 2′ from each side to pull the few weeds that come through or pick the berries. Now, having extolled the virtues of 4′ rows, I’m not entirely sure I’ll do it again. Weeding is a breeze, fertility is high, maintenance is low but I wonder if I wouldn’t get more berries if each plant got more sunlight. I may plant two rows in a 4′ space when I plant runners in half of the next row (where the onions and cabbages currently are. Pay no attention to the pale leaves on my blueberry plants. I planted into part of grandpa’s rock collection and the soil is a little chalky. I’ll get the acidity up in time. Bear with me. We have big plans for our fall garden. We are currently reading through The Winter Harvest Handbook by Eliot Coleman, a very inspiring work. We moved the two outdoor chick brooders out of the garden area as we are finished brooding chicks for the year. We spread the manure and bedding around and are planting a large area of beets to feed the cows through the fall/winter. Then we began moving the hill material out of the potato beds onto a compost pile nearby. 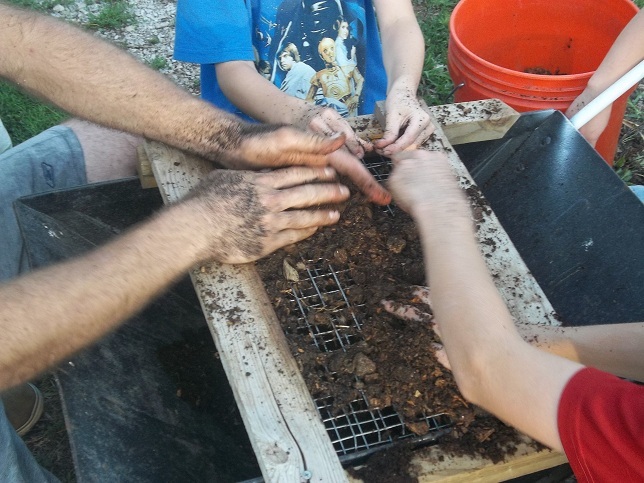 We spread sifted 2-year old compost over the bed as we planted carrots, spinach, radishes and lettuce. We will continue planting down the 30′ row, week by week as long as we can. Eventually we’ll be forced into the greenhouse. Can’t wait. 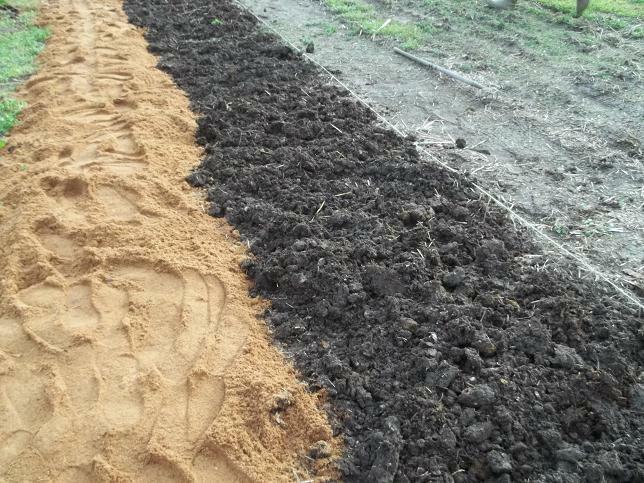 We limed the other potato row with raw aragonite, spread compost and began planting broccoli. This row will eventually be home to cabbage and cauliflower as well. The compost is mostly the bedding and offal from chickens we harvested two years ago along with garden waste from the same time period. This is my first effort at a compost pile we didn’t turn. As you might expect, we found a fair number of chicken bones and quite a few undigested wood chips. Those were sifted out and added to the current compost pile. No sign of the mountains of feathers I loaded into the pile. I have high hopes for the fall garden. We are planting in a hybrid of Jeavons’ methods and Coleman’s. Broccoli gets staggered in the hex pattern. Carrots in tight rows. We’ll see how it goes. 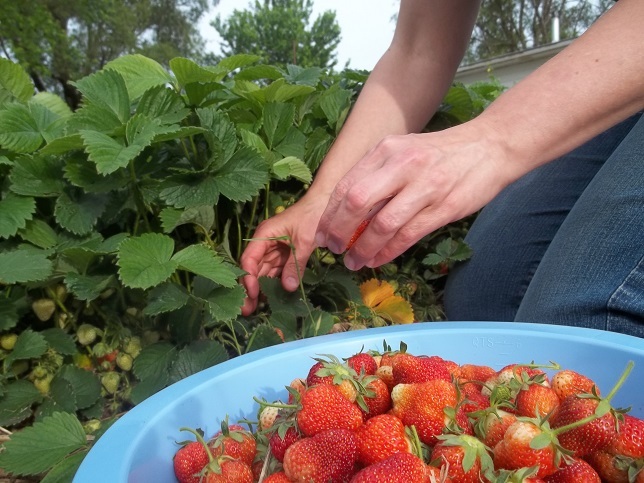 What’s in store for your fall garden? Getting started yet? 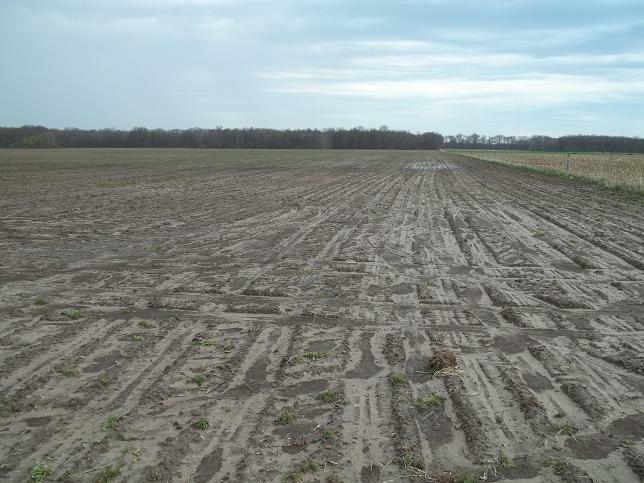 You’ll hear conflicting opinions from old-timers concerning potato planting time. Well, if my cousin thinks it’s wise to plant corn on St. Patrick’s Day (at least a month early), I can’t hide behind my calendar. 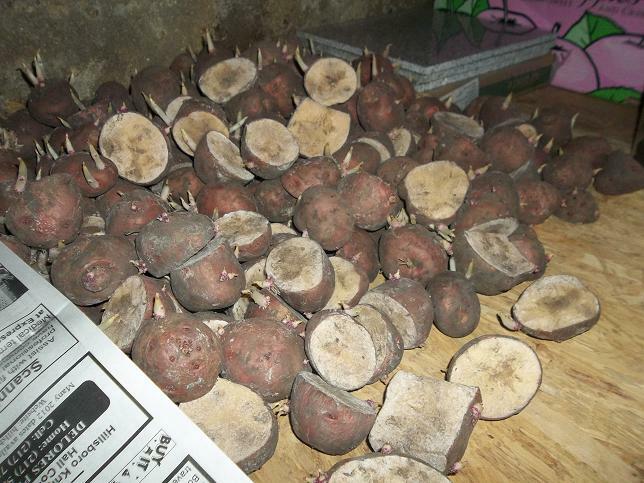 I also cut and cured my potatoes in the basement. I did this two different ways. I simply cut some and placed them in a cardboard box, others I spread on a shelf in the basement and covered them with newspaper. Here are the pontiacs as I weighed and cut them. Anything over 4 ounces was cut in half, over 7.5 ounces was cut twice. Make sure there are still two eyes on anything you cut. The cut and cure concept is not necessary, it’s just something you can do. Just like the planting time above, ask any two gardeners about cutting and they’ll tell you two different answers. Curing is the same. 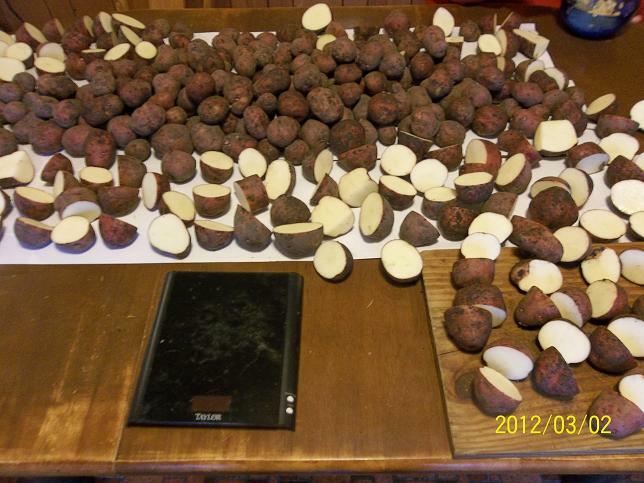 We cut but did not cure last year’s potatoes and they did fine. My sister didn’t cut anything and her potatoes will be fine. I piled some in a box and they sprouted perfectly. I sprouted some on a shelf and they sprouted perfectly. The potato is very forgiving. Garden as desired. We are big fans of “How to grow more vegetables than you ever thought possible on less land than you can imagine“. It is a book on biointensive gardening that we have had a lot of success with and was a gift from my sister years ago. I have never grown potatoes using their method so I’m kind of taking a chance. The basic idea is, you plant to the minimum spacing in hexagons making a pattern that shades out the weeds. I have an easier time visualizing equilateral triangles but you get the idea. Here is how it looks as we were planting using a 9″ spacing. 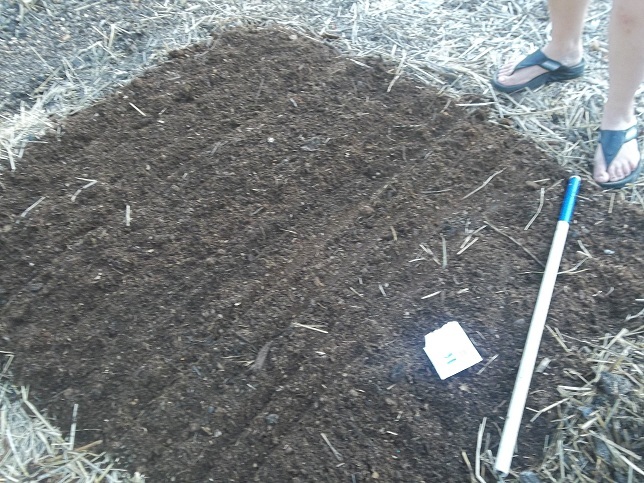 I have used various triangle templates when making holes to plant our garden but when making rows for my potatoes, good enough seemed good enough. The rows aren’t as precise as they could be but the green stuff will grow anyway. 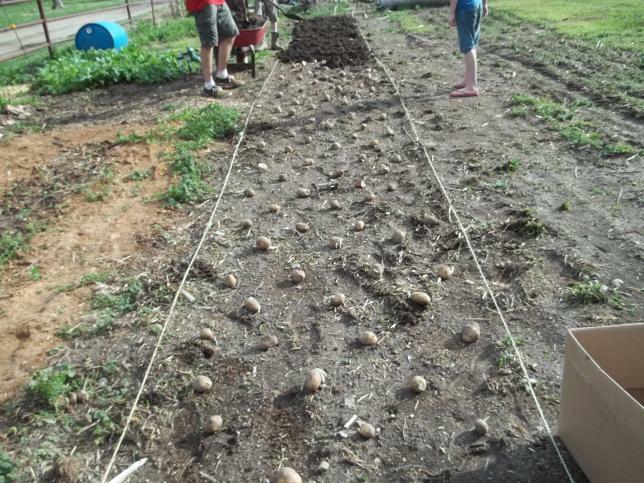 We have always planted straight rows of potatoes and hilled the rows. This time we’ll just shovel on manure or pile on straw across the entire 4′ wide row, being careful not to knock down the tops. I hope this works. As you can see, we aren’t digging the potatoes in. We are placing them on top of worked ground. Then we cover them with a few inches of composted horse manure. Most people with horses have horse manure to spare. Here is the finished row. We got tired of constantly shoveling manure so we broke up the monotony by shoveling sawdust for our path. The sawdust makes a good weed barrier and rots quickly. As the potatoes come up we will continue to maintain the bed. Look for updates as they grow. Sister added straw to the top of the row but I’m chosing not to. The dark surface of the horse manure should warm the potatoes in case it chills. I may regret the decision. Garden as you go, take notes, do better next time.